There are two types of roofs. Flat roof is a horizontal construction with a very slight pitch which allows to direct water to drains. Typically flat roofs are common for high or big buildings. It is no questions everything depend on design, but most of the multi apartment’s buildings from couple to nearly hundred floors have flat roofs. It is much easier to build and can be used to place air condition units, what is very convenient. On the flat roof is easy to build a roof top deck or even pool what will add value to any penthouse apartment. Eco friendly houses getting in popularity and flat roof is the ideal for creating a roof garden. There are also some disadvantages in having a flat roof. In cold regions with low temperatures it is a good chance of ice accumulation what can really damage the roof. Also it is a possibility of gathering water on the roof creating ponds if drainage system fails for any reason, and standing water can cause a roof leaking. 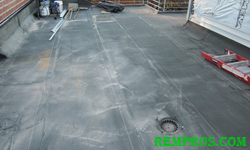 Waterproofing on the flat roof must be complete and complex - it is no exclusions, but still water cannot stay on the surface for a long time otherwise it will create a problem. Based on the materials used there are different types of flat roofs. Build up roof consist two or a few layers of roofing materials. It is usually a felt underneath which is directly attached to the roof and a bitumen as a protective layer. Single – ply membranes such as EPDM, PVC or TPO which either chemically or mechanically attached to the roof. Liquid roof coatings applied on the existing roof to extend roof performance. Some of the flat roof products can be used as a roofing material for low - sloped roofs, but always check on manufacturer recommendations. If roof pitch is more than 1/12 it is consider as a sloped roof. There are three different categories of sloped roofs base on the roof pitch. Low - sloped roofs if the pitch between 2/12 and 4/12. On such roof it is still easy to walk and perform installation. Medium – sloped roofs if the pitch between 4/12 and 8/12. Additional equipment has to be used to work on such roofs due to its steepness. High – sloped roofs if the pitch is over 8/12. Work has to be performed with extra precautions and safety due to its dangerous. 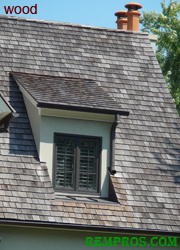 Sloped roofs are very common in residential construction. The water cannot be accumulated on sloped roof especially with a higher pitch, and the possibility of leaking significantly lower in comparison with a flat roof. But it can be damaged by strong winds what is not an issue for a flat roof. There are different types of roofing materials for sloped roof. Is a very popular roofing material on North America continent due to its relatively low cost and easy to install. 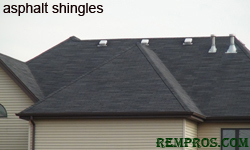 There are variety of colors and styles of asphalt shingles available to choose from. They can suit and be used for any type of house design but in the regions with a very strong winds they can be blow off. Cedar wood is commonly used for manufacturing wood shingles, but other species such as redwood or some pines also can be used as well. Installation of wood shingles can be expensive, but definitely will bring all the beauty of nature to any house interior design. Wood shingles or shakes require proper care and maintenance. Concrete and clay roof tiles are available in many colors and designs. It very heavy product and installation can be performed only on roofs with an adequate house structure due to its weight. It is very durable, but can be expensive roofing material which will last long with a proper maintenance. There are many styles of metal roofs available from metal tiles to large solid sheets. It is very durable roofing option and the common used materials are stainless steel, copper and aluminum. Metal roof can be expensive to install, but with low maintenance and long lasting performance it is one of the best roofing option. There is also environmental benefit because it is recyclable material. 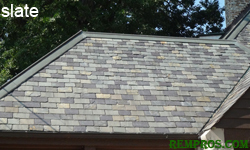 Slate is a beautiful and very durable roofing option. It is fire resistant material and with very low maintenance will last very long time. Slate is a heavy product what makes it hard to install. Also it is a fragile and after installation extra precautions should be taken while doing home maintenance which requires walking on the roof. In the last years synthetic slate getting more in popularity. It is lighter in comparison with a natural slate it easier to install. Compare the costs of roof repair and replacement.